Leek is larger than onion. Like garlic, the leaf blades are dorsiventrally flattened rather than being radial. he leaf bases of leek may store some reserves as they do in onion but they do not thicken into a bulb. 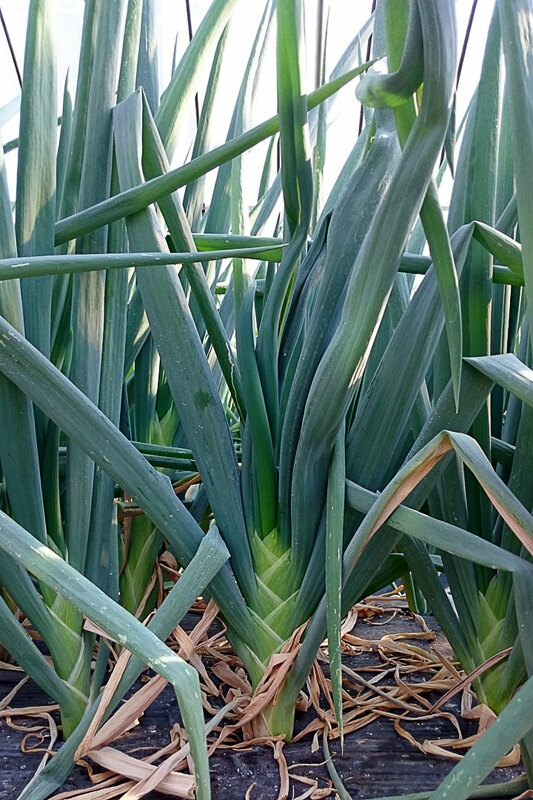 The biggest feature of our southern giant leek is its sweetness and size. It has been consumed since ancient times in our area without any cross over of chromeosones, It is a kind for native breed unlike present general leeks you see everywhere in supermarkets. Nanbu Futo Negi has a long history however it had been difficult to cultivate and breed for farmers, it was almost about to be extinguished. It was unwieldy as it gets sicker and weaker easily. In general cultivation of leeks, in order to extend the part of the white stalk, you do not hit the stem part on the sun, and carry out “soil work” manually that covers soil on the stem at the growth stage. As Nanbu Futo Negi grows, the leaves are divided into right and left, so it is easier for soil to enter the split part of the stem and leaf, so it becomes more susceptible to disease. For that reason, it took time and effort to put the figure on display, unlike machine production as we do today. 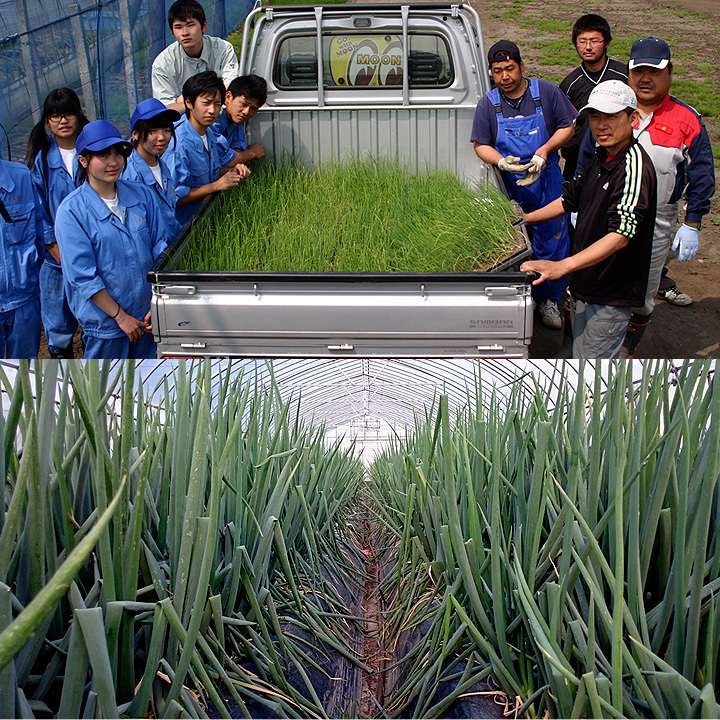 Young farmers and local high school students (Nakui Agricultural high school) studied not only various cultivation methods but also technology and engineering, plant breeding, nutrition, and soil management to figure out how to easily cultivate Nanbu Futo Negi. Turn up the soil containing plentiful of the former fertilizer, stretch the soil, put a soil cover in the ridge, challenge the way to open the hole of about 40 cm deep and plant the seedlings. The white root part grows under soil cover, and furthermore, grass does not grow easily, so it has become possible to efficiently cultivate southern giant leeks. 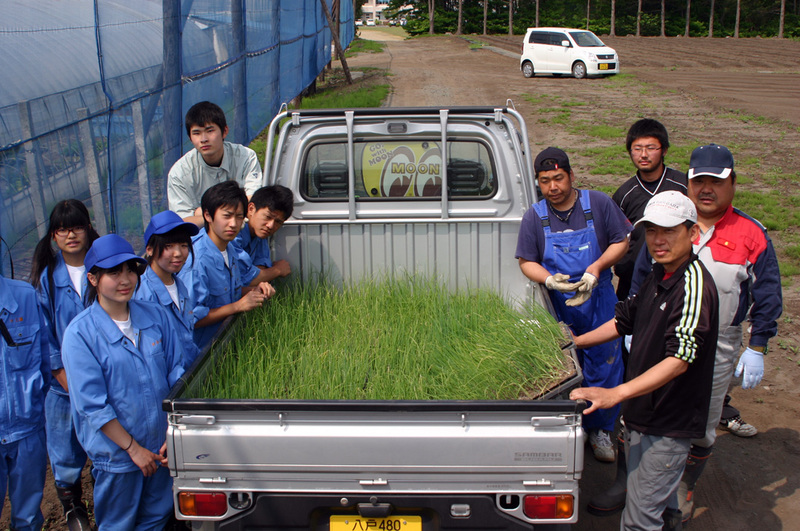 In 2012, local high school students finally made it for a “resurrection” of Nanbu Futo Negi to local farmers. However, their start was not good. Many farmers said that "Today’s leek with techniques is more productive than ever. We drive machines fitted with GPS mapping technology on computers that waste fertilizer, or analyzing feed conversion ratios dairy leeks.” and "I cannot sell old leeks with no hybridization. We are the farmers of the future." one after another. When they were disappointed to hear them, the students met our company corporations who were working on local revitalization of the town, and three young farmers cooperated in cultivation. Because of the heavy rain and typhoon in 2013, Nanbu Futo Negi got sick one after another. Those were not to be sold and impossible to leave results, with only three producers. In that winter, those three farmers appeared on town magazine and they tried to recruit farmers who want to join the journey of planting Nanbu Futo Negi. 10 farmers were gathered, mainly young farmers in the town who sympathized with high school students. The passionate young farmers prepared a brand-new shipping system. In 2014, they had many talks and meetings with ten farmers, discussing about every aspect of management, from planning and production to merchandising and marketing. They also made business negotiations with local supermarkets and farmer’s markets, department stores and restaurants in the metropolitan area, aiming at 2000 transactions a year. And in the end of October the hardworking farmers and high school students resulted in the first shipment. They were able to ship 2,800 leeks sharply exceeding their target of 2,000 leeks. It was a giant leap for the locals. 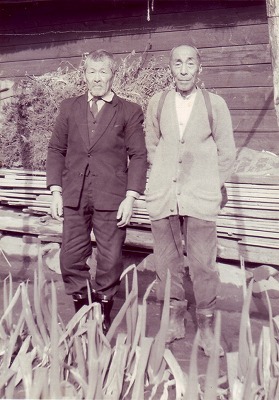 Kougorou Kudo and Tadao Todome started researching about how to localize leeks in 1918. Breeding Goals of Leek: a. Winter hardness b. Resistance to bolting c. Dark green leaf blade d. Freedom from bolting e. Long shaft (the blanched pseudo-stem formed by the young folder leaf blades) length In 1955 it was finally registered to the Ministry of Agriculture, Forestry and Fisheries of that time. 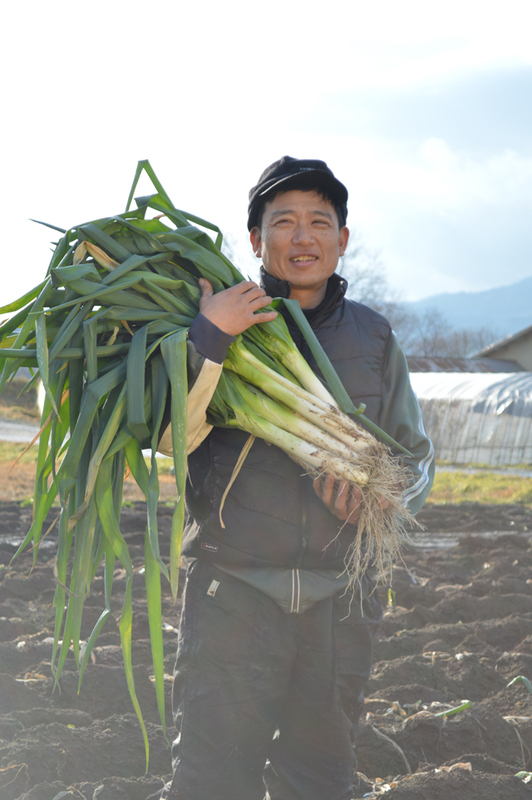 Although it was produced by many farmers in town, as the development of new varieties advanced and mechanization advanced, Nanbu Futo Negi followed the path of decline in a stroke. Many years later the local high school students were successful of increasing the number of seeds and had a high awareness of growing this local leek with young farmers. 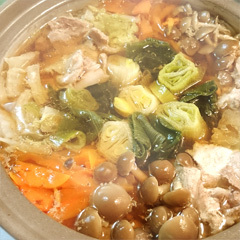 There is a slightly unique regulation called Nabe Ordinance in our town. 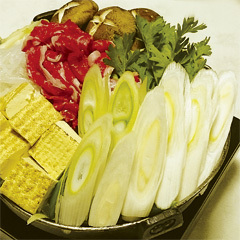 On the 22nd of every month, you shall eat Nabe the big Japanese stew saying toot! toot! 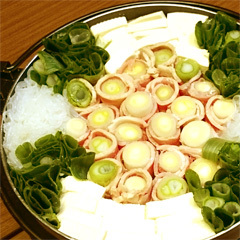 by surrounding the hot pot with family and friends, talk and laugh a lot. Both a vegetable and a condiment, the leek has always enhanced a wide variety of dishes with its unique aroma. Actually, the leek can be eaten at all stages of its growth and is far more delicate tasting and tender if picked young. And this is the stage at which our leeks are now. The trenches are to facilitate blanching. As the leek grows the trenches are progressively filled with soil thus creating the long white stem prized for cooking. The time involved in trenching and the four to five months or so required for growth are the main reasons leeks are more expensive than other vegetables in the onion family. While uncooked leeks are strong tasting and not appealing in texture, cooking them, whether, braising, steaming, or boiling, transforms them into a smooth tasting, delicate, comfort food. 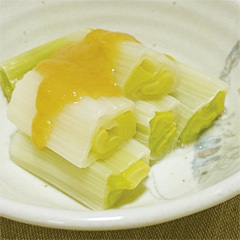 Leeks appear in numerous surviving recipes. 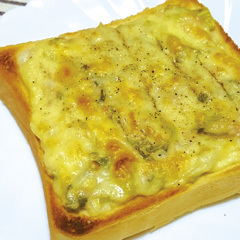 You will enjoy Toast, Kakiage, Tempura, Sukiyaki, Teriyaki, Sumiso-ae, Kimpira and more. 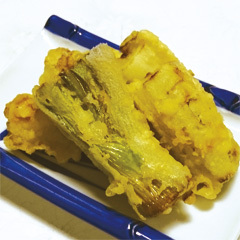 As a local traditional vegetable, you can also see them in the local school lunch. 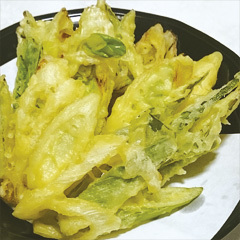 When we offered our leeks together with local cuisine of the Tohoku region called “Hit-tsu-mi” in October 2017, it was a pleasant result that kids did not leave anything behind the dish. No leftovers! Everyone liked it. To add more, from customers who bought at department stores in the city area sent us letters saying “what a touching story of this good old leek!” “We loved the taste of this leek, so unique!” The thoughts of high school students are propagated to young farmers and had become a “symbol” of the area by involving the town. This is the true meaning of Value-Added Product. A group of young farmers calling for a new approach to the aging agricultural population even though there is a serious issue of a sharp falling birthrate. We also seek to promote the economic health of our town, its agricultural industry and the communities, businesses and people supported by agriculture. We want to keep our proud Nanbu Futo Negi in the center of our heart! Agriculture is all we have got. 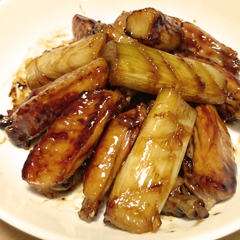 Please contact us for more information on our Nanbu Futo Negi; We would love you to be the first to taste our fresh leeks. Cheers to our traditional vegetables for next hundreds of years to come. Copyright(c) NPO Aomori Nambu-no Tassha mura All Rights Reserved.